North Carolina senior forward who recently was named the ACC Player of the Year, added another honor on Friday when the ACC named him the recipient of the annual Skip Prosser Award. 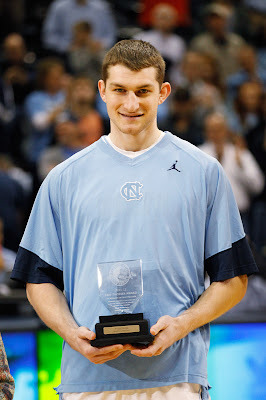 It’s the second consecutive season that Zeller has received the honor. The award, named after the former Wake Forest basketball coach, is given annually to the top men’s basketball scholar-athlete in the conference. Zeller, a four-time member of the all-ACC academic team in basketball, also earned academic all-American honors in each of the past two years. He was recently named the men’s basketball academic all-American of the year by the College Sports Information Directors of America. Zeller carries a 3.62 cumulative GPA in UNC’s Kenan-Flagler Business School. He has made the dean’s list six times. Zeller has excelled on the court, too. While leading the Tar Heels to the ACC regular-season championship, Zeller averaged 16.3 points and 9.3 rebounds per game.